Whenever I teach a class or a workshop, I usually try to include a segment on the shapes of stories. Bolaño’s By Night In Chile is a self-referential linear confessional, as is Bernhard’s The Loser. Lispector’s The Passion According to G.H. is a recurrent fever dream that moves the narrative forward by doubling back to a fixed set of anxious, grotesque obsessions. Baker’s The Mezzanine and Duras’s Emily L. are imminent explorations of a present moment that is rapidly shifting, emerging, and disappearing. The Erasers by Alain Robbe-Grillet ends where it begins, yet mysteriously different, irrevocably altered. Finnegans Wake begins in the middle of a sentence and ends in the middle of a sentence and, of course, it’s the same sentence. Joyce packed his groundbreaking encyclical with as much of life both lived and imagined as any genius could possibly manage. Take the most common devices used in fiction — plot, character, setting, conflict, and metaphor — and view them as shapes. There are linear stories, moving forward or backward along a single trajectory. There are multiple lines that coalescence into one pluralistic yet singular image. There are static, singular images of the present, like photographs: sparse, minimal, and distant. Then there are those narratives that are like a picture that someone smashed with a hammer into 1,000 shards — each broken piece refractive of the whole, yet reflective of its own inner truth. 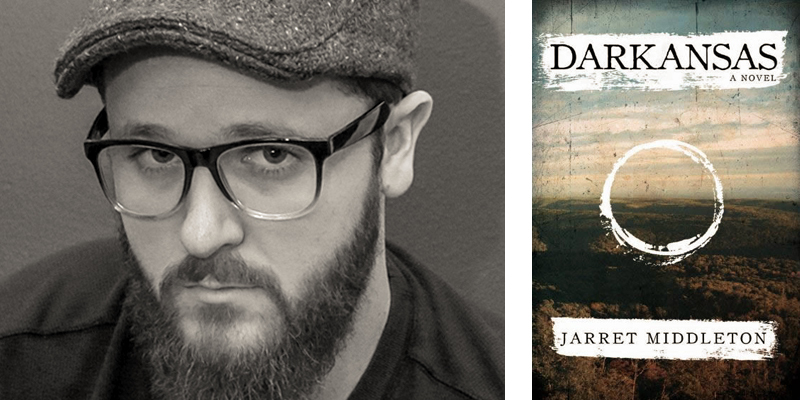 Darkansas tells the story of a black sheep country musician named Jordan, who returns home to the Ozarks for his twin brother Malcolm’s wedding. While he is home, he uncovers a dark vein in their family history. Going back to the end of the Civil War, each generation of men have been twins, like he and his brother, and in each generation one twin has always ended up murdering their father. This cyclical murder myth has played out across every generation for the past two centuries, rumbling below the surface and dictating the course of each member of the Bayne family’s life. Now, it threatens Jordan and Malcolm and ultimately the life of their ailing father, Walker Bayne. When I was still doing research for the book, not knowing how or where I wanted to begin, I began mixing together different stories, myths, and histories until I realized that they were producing new ideas that I had never had before, opening up new possibilities where before there had only been roadblocks. Out of everything I was reading, two myths stood out above the rest. The first was "Monster Slayer and Born for Water," a Navajo myth that deals with the relationship between hero twins born for the purpose of killing alien gods to make earth safe for humans. Monster Slayer is the preternatural killer while Born for Water bears witness to the killing. The second myth was a Greek one, wherein the cult of Diana celebrates the spring equinox by performing a fertility rite in a grove in ancient Aricia. On this night, anyone is allowed to challenge the king to a duel, and if you kill the king you become the king. It’s the "if a tree falls in the woods" scenario, only at the heart of human agency. Reading these two seemingly unrelated myths together, side by side, a structure started to emerge. The first dealt with the fascinating dichotomy between the twins. Monster Slayer, who is born a killer, can't afford to have any conception of the meaning of the act he is fated to commit. In other words, he isn't born with a conscience because any moral deliberation about his actions would interfere with his ability to act. Born for Water, then, reflects his brother’s actions, ensures his safety, and also provides proof of his brother’s deeds. Their relationship isn’t just familial, it is archetypal, and raises all these questions about the phenomenology of murder. Does a murder mean anything unless someone is there to witness it? It’s the "if a tree falls in the woods" scenario, only at the heart of human agency. The killer needs a witness, and the watcher has no purpose unless there is an act to be witnessed. Not only do they need each other, they ground each other’s being. In the Arician grove myth, it is a cycle of patrilineal succession driven by the lunar-feminine observation of the turning of the season. On the surface, a commoner can reach the height of power and become the king, but the reality is that killing the king signs your own death warrant, because the next person to challenge the king will then kill and succeed you. Within the ontological dichotomy of killer/witness and the cyclical kill the king/become the king who is killed, the archetypal form of the story I wanted to tell began to surface and merge with the characters and setting I was already working with — the mysterious geography of the Ozarks, the history of bluegrass music, forgotten Civil War battles on the Missouri-Arkansas border, moonshine, poverty, old-time religion, and the surreal origins of the Bayne family curse. The twins in Darkansas are as different as can be. One of them has the capacity to kill, the other does not. Their father is the patriarch or "king" who ends up being sacrificed, only to be replaced by the son who is revealed as the true killer, doomed now to be killed by one of his sons in turn. There is something larger at work that none of them are aware even exists, yet it shapes their lives regardless of free will and the decisions they make. The killing occurs in accordance with the harvest. The blood that is shed through the myth ensures the fertility of the soil, guaranteeing a bountiful crop come harvest time. The myth is the lifeblood of the land itself. Jarret Middleton is the editor of Pharos Editions, an imprint of Counterpoint Press. He cofounded and operated Dark Coast Press, an independent publishing house based in Seattle, and has been profiled in Shelf Awareness, Publishers Weekly, The Stranger, and elsewhere. His fiction, essays, and reviews have appeared on Vol. 1 Brooklyn, in The Collagist, and in a number of anthologies. He lives with his wife in Seattle, Washington. Darkansas is his first book.